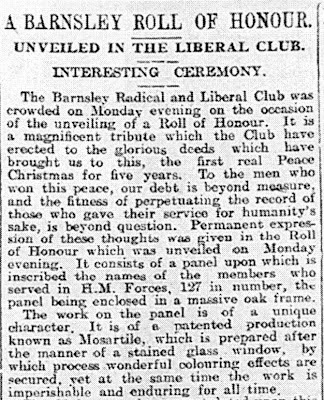 A Barnsley Historian's View: Barnsley Radical & Liberal Club War Memorial "enduring for all time", so what happened to it? 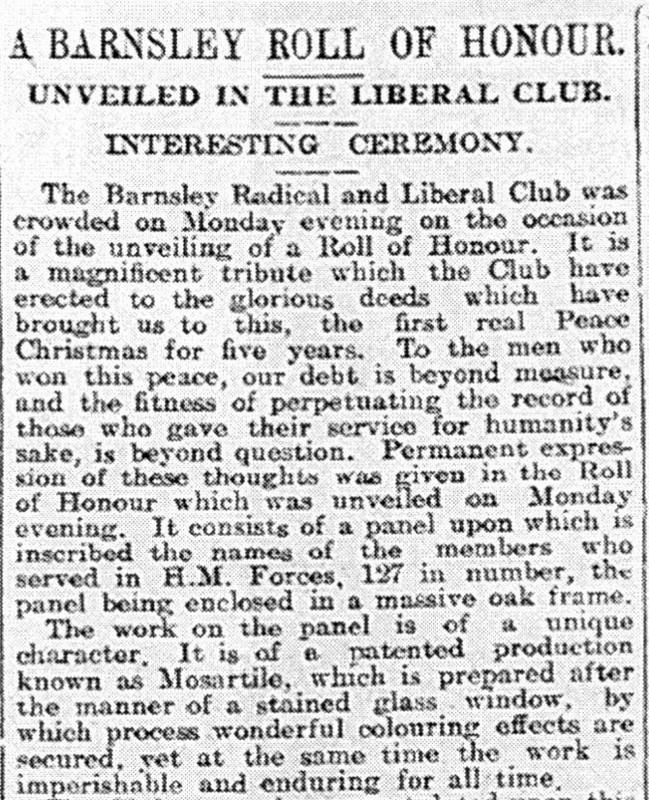 Barnsley Radical & Liberal Club War Memorial "enduring for all time", so what happened to it? As you may have read in the last few weeks I have been researching War Memorials in Barnsley. My plan (it's a cunning one!) 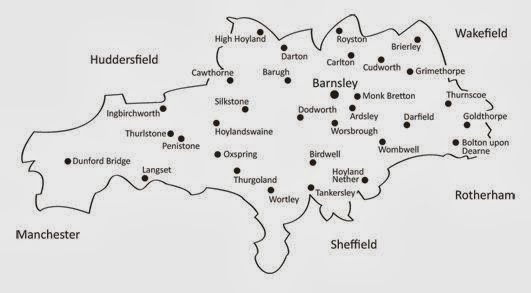 is to search the digitised Barnsley Chronicle in the years immediately following the First World War for all references to memorials and see how the plans for commemorating the men who lost their lives develop in Barnsley and the nearby villages. It's a slow process - I can only book one hour a day in Barnsley Archives on the laptop that gives access to the digitised newspaper - you might be thinking, well she could still do it the old fashioned way on the microfilm, but have you tried reading those old newspapers cover to cover? Searching electronically, even just a month at a time (which is the way it works at the moment) is much faster than scanning visually through eight large pages per issue of very small print. I'm picking up advertisements as well as news items and the smallest mention, buried deep in the proceedings of various parish council meetings is being revealed. It's really very good! This is the top couple of paragraphs of a long article about the unveiling of a Roll of Honour in a club in Barnsley. Unusually it mentions that the 127 names which were inscribed on the panel are of the members who "served in H. M. Forces" not just the men who died. As so many of the records of First World War soldiers were lost in the blitz (60% of the records were destroyed and many more damaged - those that remain are known as the Burnt Records for very good reasons!) a list like this would be invaluable in identifying men who served in the war for whom we have no other records. Further down the page the piece comments that this is an updated Roll of Honour, adding the names of the men who went to serve after the first panel was erected (it would be interesting to look back into the war years to find out exactly when this was - but that would be an extension to my project). The poignant thing about this section of the article is the description of the tablet, "which is prepared after the manner of a stained glass window by which process wonderful colouring effects are secured, yet at the same time the work is imperishable and enduring for all time". "Enduring for All Time" eh? That is a nice thought, but unfortunately it appears not to have been quite as good as they hoped, for just 94 years later the panel is probably lost. The OH's best guess is that the Barnsley Radical and Liberal Club was the building which now forms part of Escapade nightclub on the end of Wellington Street in Barnsley town centre. If that was the case then I think even that must have been a rebuilding since 1919 as the old maps show a foundry on the Escapade plot in the 1930s. A newspaper report, found on Find My Past, notes a serious fire in premises of the Barnsley Radical Club in Market Street in 1907, could that be the same organisation? By a lucky chance searching on my Open University Digimap account I found the above map snip which seems to be made up of two different maps - the section on the right shows the Barnsley Radical & Liberal Club clearly on Market Street - and the left hand section shows it where the OH thought it was on the corner of Wortley Street and Wellington Street, where Escapade is now (although the nightclub has expanded to fill the whole block). When they moved premises they may have moved the commemorative panel, however the chances of a memorial plaque being extant in a night club? Slim and none I would have thought - but please prove me wrong if you can! This picture on the Tasker Trust website shows the building on Wellington Street, but with scaffolding obscuring the front. The Rose and Thistle pub shown in the picture is now Voudou or Silvers Bar. The closest I can find to a picture of the Market Street site is this one here on the Tasker Trust website again. Is the club the building with three gable ends facing into the street, just below Wellington House? If so that building still exists - part of it is a take away food shop I think. Maybe they completely rebuilt after the 1907 fire - that could very well be an early 20th century building. The cutting also contains some social comment, appropriate perhaps to a political club. 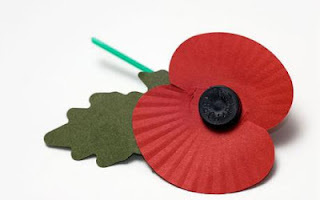 It discusses the men who went to war and those who bided their time, "there might have been some who did not go at first because they had their wives and families, and mothers and fathers to look after". This is very interesting - so they are suggesting that the great rush to volunteer that we have read about was tempered by a sense of responsibility for families and dependants even if people did think it would all be over by Christmas 1914. The article goes on, "when Kitchener asked for 500,000 men he would have got a million without any difficulty had better provision been made at that time for dependents". I wonder what provision was made for dependents and how and when it changed, if indeed it did. I know that conscription took effect in early 1916 and slightly later for married men. Was it the case then, that the majority of the men who volunteered in 1914 and early 1915 were young and single? This second snip notes that 119 men returned to Barnsley from the club members listed on the Roll of Honour, eight men did not. It does not give their names. Minute books or membership rolls from the Barnsley Radical & Liberal Club might help identify these men, they may still survive in Barnsley Archives - Note to self - remember to ask next week! 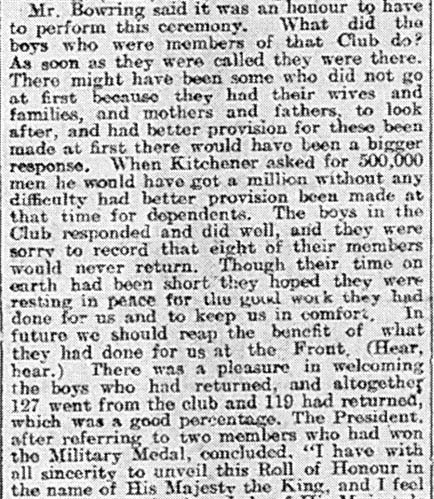 Two of the club members won the Military Medal ... but again no names are given, this is quite frustrating.